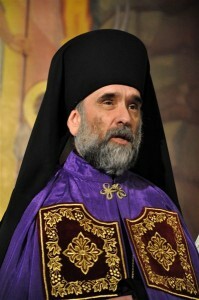 Bishop Michael (Dahulich) of New York and New Jersey. I grew up in Binghamton, New York, in a parish where the church was the center of my life. I served as an altar boy and went to the Church School, which was huge! We had a teenage Bible Study group; the church had a basketball team (which I was not very good at). I ran the parish library. We had altar boy practice every Saturday – we sang the Liturgy and learned about serving the services – there were as many as 36 altar boys at a time! So, almost every weekend, I was in church for Saturday Liturgy, Vespers, Matins, and Sunday Liturgy… plus holy days, baptisms, weddings, funerals and everything else that came with life in the Church. After high school, I went to college nearby and lived at home. 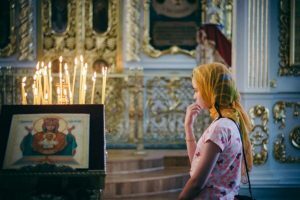 I never had the problem of wondering, “What do I do when I’m on my own?” I worked out my class schedule so I could be at the Liturgy during the week when there was one. Church was the place to be. I loved being in church, and I loved what I was doing in church – especially serving in the Altar and learning about the Faith. So it was only logical for me to want to become an imitation of my parish priest, Fr. Stephen Dutko of blessed memory, so that I could have, and give, that same kind of experience. I wanted to be like Father Stephen. And so I did. I went to seminary right after college. I got married and ordained at 22 years old. I was assigned to my first parish, Saints Peter and Paul Church in Homer City, PA, and I was raring to go. Then it all changed. After 29 days of marriage, my wife and I were in a car accident. She was killed instantly. I was in the hospital – in a coma. I came out months later, confused and bitter, guilt ridden and doubting. I was feeling all those kinds of things that a person would feel in that horrific situation. Why did God let this happen? It had to be somebody’s fault. All the confusion, all the anger, definitely made me think about not being a priest anymore. However, I couldn’t conceive of not serving at the Altar. I could not conceive of living my life outside of that experience that I had had all those years. I just could not imagine that. So, rather than walk away from the Church, I did what I really needed to do – and what I have counseled so many people, of all ages from the youngest to the oldest, to do when we have these terrible, tragic experiences. And that is to draw closer to Christ in the face of pain and agony and loss. When I did that, it was not just an inner, “me and Jesus” kind of experience. The Lord came to me, and began to heal me through the faces, the words, the embraces, the love of His people: the Church. My spiritual father was one of them. He was tough on me. He told me, “Your faith just has to kick in.” One of the questions I raised was, “Where was God when all this happened?” And he said, “He was in the same place the day that Debbie died that He was on Great and Holy Friday, when His Son died.” He told me that even though that particular Tuesday when we had the accident might have been a Good Friday to me… still, Good Friday is not the end of the story… Pascha is. He reminded me that Christ triumphed over death – and I had to believe that my wife was a sharer in that victory and in the Resurrection. So, I never left the Church. I never walked away from the priesthood. My first parish as a priest became a replica of what I had experienced in my home parish as a young person… and those people who I served as a young widowed priest helped me nurse back to spiritual health – as well as me helping them in their dark moments and in their difficulties. It wasn’t just me, as their priest, taking care of them. Guided by God, as His family, we cared for each other. A famous Christian writer named Tertullian, who lived less than 200 years after Jesus, wrote that “A Christian alone is no Christian.” He meant that no one is saved alone… it takes the Church to save a soul. Whenever I look back on that incredibly painful time in my life, I am more and more deeply convinced that I never would have survived – not spiritually, and maybe not literally – without the Church. I do not mean just the Church as a building, although that is the place where we meet and pray and even play together. 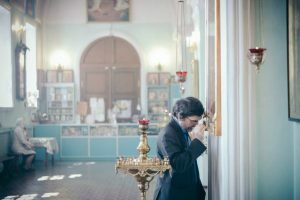 I mean, the Church as a community; the constant presence of the people of God – my spiritual father, my parishioners, my brother priests and their families, with all of the guidance, the prayers and the love that they have to share. Even though my hope for you who read this is that you never have to go through what I went through, I pray that somehow, whenever you do experience difficulties, doubts, and obstacles, by God’s grace, your faith will “kick in.” I pray that you will seek, and find, the healing and the love that Our Lord offers us in the faces, the embraces, and the prayers of others — the love of Christ Jesus, shown within the community of His Church. One of my favorite quotes in the Bible is from St. Paul’s Epistle to the Romans, in which he asks the question, “What can separate us from the love of Christ?” (Rom. 8:35). And he answers that neither height nor depth… nor life nor death… nothing can separate us from the love of God which is in Christ Jesus our Lord. Thanks to the Church, I am living proof that this is true.